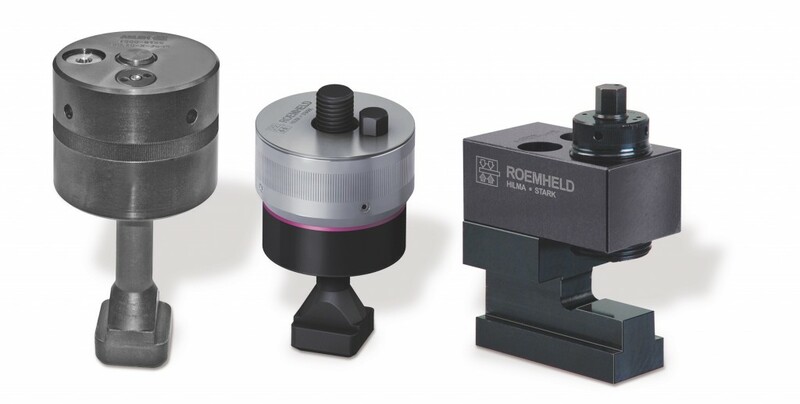 Roemheld offers a wide range of new clamping tools that enable workholding systems on deformation presses to be retrofitted simply, cost-effectively and safely. New mechanical and hydraulic clamping elements enable faster set-up on virtually any press or machine. In addition, the new version of the mechanical variant is fitted with a visual clamping force display, which provides additional safety during clamping. From left to right): hydro-mechanical clamping nut with clamping force display and continuous thread, followed by the mechanical version with clamping force display and through-hole and, on the right, a mechanical sliding clamp with clamping bolt. From higher flexibility and shorter set-up times when a great variety of tools are involved to the automation of processes or clamping with high forces and in tight spaces, virtually any intended application can be realised thanks to Roemheld’s large selection of mechanical, hydraulic and electromechanical semi- and fully-automatic clamping elements. Roemheld mechanical and hydro-mechanical clamping nuts are particularly suitable as cost-effective solutions as they can be installed quickly and simply without the need for piping. Thanks to its compact dimensions, the Roemheld hydro-mechanical clamping nut is ideal for applications where space is restricted. In addition to the visual clamping display on the mechanical clamping element, an integrated spring assembly prevents a loss of force when used with deformable components or clamping edges. Both versions are maintenance-free and, thanks to the continuous thread, suitable for all clamping edges. Many different model variants are available with clamping forces up to 150 kN and low tightening torques of just 30 Nm. Customers who want a higher level of automation can choose from a wide range of standard hydraulic clamping elements such as hollow piston cylinders, sliding clamps, angular clamps and wedge clamps. The use of such elements reduces clamping and release times to between just two and four seconds. In addition to these time savings and a high level of automation capabilities, Roemheld hydraulic clamping elements deliver uniform clamping at all points without applying force with the ability to monitor clamping forces. In addition, all the elements are easy to install and therefore ideal for retrofitting. In addition, Roemheld can provide matching high-performance and energy-saving hydraulic power units that are adapted to the requirements of the clamping elements being used.